In an instant, you have what you want. Swipe the card and ding! Whatever your heart desires, as long as you have the credit available, can be yours. Vacation to Maui? Done. A brand-new Sleep Number mattress? Done. A brand-new BMW? If your credit limit is large enough . . . then done. Credit is so easy. It’s just part of our culture. But it doesn’t have to be part of your life. You can love your life without credit cards. I love shopping and spending money, but I hate credit cards! The majority of Americans overspend partially because credit card companies make going into debt so easy. You end up spending way more money than you intended by the time the bill comes at the end of the month. It’s like you’re living your life through a rearview mirror! When your paycheck comes in, you’re living in the past and paying for things you’ve already done, movies you’ve already seen, and food you’ve already eaten. When you use credit cards, it’s like you’re living your life through a rearview mirror. That’s no way to live! But it hasn’t always been that way. Just a few decades ago, credit cards were much more of the exception than the rule. The cards became a thing fairly quickly, with 42,000 users in the first year. (2) It didn’t take Americans long to love the idea of credit! 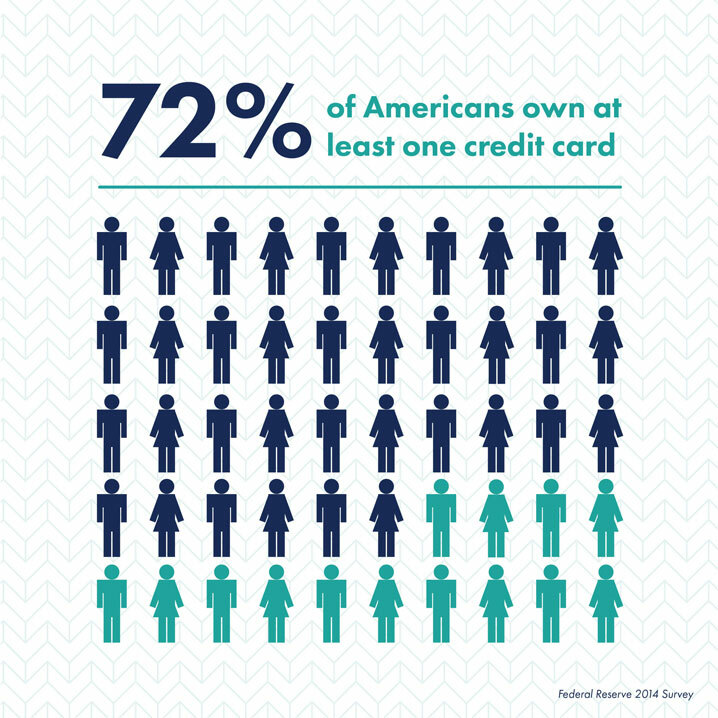 By 2014, The Federal Reserve found that 72% of Americans have at least one credit card. (3) In just over 50 years, we’ve gone from a society that rarely used credit cards, and hardly understood the concept, to one that is so dependent on credit we can’t imagine life without it. And that’s exactly where the credit card companies want us. They make a killing on how easy it is for us to swipe to get what we want. The Federal Reserve says Americans are approaching $1 trillion in credit card debt. (4) Did you catch that? $1 trillion! We love our credit cards, but they’re stealing our joy! You sign up for a card, maybe on a whim when you’re 18, and before you know it the power of plastic is in your hand. Making a purchase is just so easy now. You don’t even have to pay . . . at least not right away. So you buy a pair of shoes, maybe a hat, and (why not?) a nice flat-screen television. Awesome! Awesome, that is, until you get the bill the next month. You’ve suddenly got a $1,200 bill with a 15% interest rate. Oh, but you only have to make a $48 minimum payment. That’s easy enough, right? Until you realize (or maybe you don’t) that you’ll need to make 71 minimum payments of $48 with a 15% interest rate—which adds up to $3,408—to eventually pay off that initial $1,200! Was the credit card worth it? Talk about stealing your joy! That’s the danger of a credit card. It’s like death by a thousand cuts. Before you know it, you’re trapped with thousands of dollars in debt—all because you couldn’t delay a purchase until you actually had the money. So how have credit card companies done it? How have they shaped our spending habits? It all starts with marketing. In 2015, Capital One spent $250 million on advertising their products, the most of any company. The top six credit card companies combined spent nearly $900 billion on marketing. (5) These guys know how to market, and they’re willing to spend lots of money doing it. You might say, “I’m too smart to fall victim to clever marketing.” Oh yeah? When’s the last time you were tempted by an offer of 0% interest for a year? Low interest rates lure you in. You think, I’ll pay it off at the end of the month, anyway. But then a year later, after the interest rate has adjusted to a much higher rate, you realize you weren’t quite able to pay off that card every month. Oh well. As long as you can make the minimum payment every month, you can afford it, right? Wrong. I hate to say it, but if you can’t afford to pay cash for it, you can’t afford it. The idea of “cash back” seems nice—after all, who doesn’t love cash—but in reality, you’re spending thousands of dollars to get $100 back. The “cash” gets rolled into your account and probably adds up to just cover your annual fee. Why not just go ahead and keep your cash? Think about it. Isn’t it much easier to swipe a card than pull out a $20 bill? You have to pull that cash out of your wallet and watch as you hand it over. Compare that to a quick flip of the wrist. It’s so easy to use a credit card! And that’s why they’re so risky to use. I hear it all the time: I only use a credit card to improve my credit score. I will never be able to rent an apartment or get a house without a credit score. Sound familiar? You’ve probably heard that the almighty credit score is just a way of life. You can’t make it in life without a credit score. That’s simply not true. I have never borrowed money in my entire life, so my credit score is undetermined. It’s amazing, you guys! When you have cash in the bank, you’re not tied down by these myths. And that’s what I want for you—to live the life you want without obsessing over your credit score. Let’s go over the myths floating around about credit scores so that you will see you really can live without one. Your credit score is a sign you’re winning with money. Nope. Your credit score—maybe you’ve heard it called a FICO score—tells you one thing: You’ve gone into debt. Sure, you pay your credit card bill on time, but you’re in debt. It’s all about debt. You could literally become a millionaire today, and it would not change your credit score one bit. The best indication that you’re winning with money is your bank account, not a high credit score. You need a credit score to rent an apartment. This one’s not true either. If you have your first and last month’s rent plus a security deposit, a majority of apartment complexes will work with you. You might have to try two or three, but they’re out there. Keeping a credit score to get low rates on car insurance is a smart move. It’s true that no credit score or a bad credit score will drive up rates on your car insurance. But you’ll more than make up for it with all the money you’ll save by not paying interest to a bank for being in debt to build your score. I always tell people to ditch the credit cards and go with the debit card. Since it’s linked directly to your bank account, you have instant accountability on how much you spend. That “swipe” isn’t quite as easy as it is with a credit card. Still not convinced that credit cards are a bad idea? Let me get real with you for a little bit. I was blessed to figure out what I wanted to do with my life at an early age. Since I was a kid, my passion has revolved around the financial principles my parents taught me. One night back in college, a few friends and I took a study break and went to a local burrito restaurant for dinner. As we walked up to the place, we noticed a guy slightly older than us sitting at a table at the entrance. The table had tons of brochures scattered everywhere and a big banner overhead. He said, “Hey, girls, do you all want a free dinner tonight?” For a handful of broke college students, the answer was not difficult. As you can imagine, we enthusiastically said yes! “Great!” he replied. “Just sign up for this credit card, and we’ll pay for your dinner.” I laughed it off, but one of my friends walked up and filled out the form right then and there. It took her all of about two minutes, and she was done. After we got our food and sat down, I asked my friend why she did that. She said, “Oh, Rachel, it’s no big deal. When it comes in the mail, I’ll probably just cut it up. And if I end up keeping it, I’ll use it just for emergencies.” That phrase sent off alarm bells in my head. My parents had always taught me that’s how so many people end up with a pile of credit card debt. They think they’ll just use credit cards for emergencies, but then life happens and they end up in debt, one little “emergency” at a time. That’s exactly what happened to my friend. A month after getting that card in the mail, her laptop broke, so she ran out and charged a brand-new one on her “emergency” credit card. Soon after, a mutual friend got engaged, and she charged a bridesmaid dress too. The next month, she received a $1,100 credit card bill in the mail. She didn’t have the money to pay it, which created a lot of stress. She had no idea how to pay the bill, and she panicked just thinking about what would happen if her parents found out. Within a month, my friend went from carefree to full-blown panic mode because of that little piece of plastic. And it was all for a $7 burrito. Too many college students see getting their own credit card as a rite of passage into adulthood. But getting a credit card doesn’t make your student an adult; it makes her a slave to debt and sets her up on a potentially lifelong course of spending money she doesn’t have. When you train your child from a young age how to spot those marketing tactics, and if you teach her that the borrower is truly slave to the lender, you’ll empower her to walk right past the debt salesman at the college burrito restaurant. Every time I hear someone talk about being debt-free, I see so much more for them than just a life without payments. I also see opportunity. I see opportunities for them to take a portion of their paycheck and, instead of sending it to MasterCard or Sallie Mae, they write a check to help build an orphanage in Africa or help an underprivileged family at their local church. I see someone who can now begin building their kids’ college funds instead of sending monthly car payments to the bank. I see someone who is changing their family tree forever. Think about what you could do if you didn’t have debt or if you weren’t relying on a credit card to fund your life. Imagine how cool that would be to live like no one else so you can live and give like no one else! Think about what you could do if you weren’t relying on a credit card to fund your life! How do you kick the credit card habit once and for all? Changing the habit starts with you! It doesn’t have to be complicated. And it’s not just a simple matter of math. It’s a matter of common sense. How we spend our money is much more of a behavior issue than a numbers issue. It shows our priorities. So if 40% of your budget is spent on restaurants, that says something about your priorities. You like eating out! Ditching credit cards is really just about making a stand—deciding that you’re not going to “buy” what you can’t pay for, and that debit cards and cash are the way to go. After that, it’s just about making practical decisions every day to form real behavior change. Let’s begin with a budget. First, figure out how much money you have to work with for the upcoming month—before the beginning of each month. This includes your income, your spouse’s income and any extra income you all may have.